For once, the race went according to the script for Toyota. 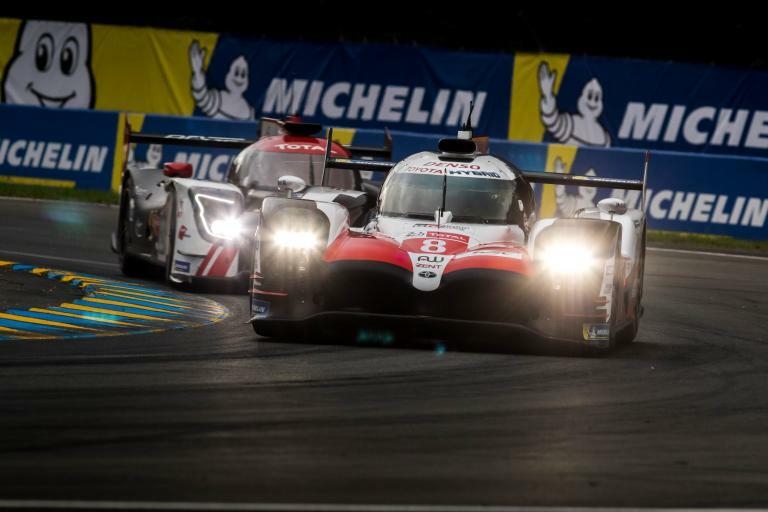 Never seriously challenged throughout the 24-hour race, the Toyota TS050 Hybrid of Sebastien Buemi, Kazuki Nakajima, and Fernando Alonso took the overall victory over the sister car of Mike Conway, Kamul Kobayashi and Jose Maria Lopez to finally give Toyota what they have worked so hard, and spent so much money on: a Le Mans victory. 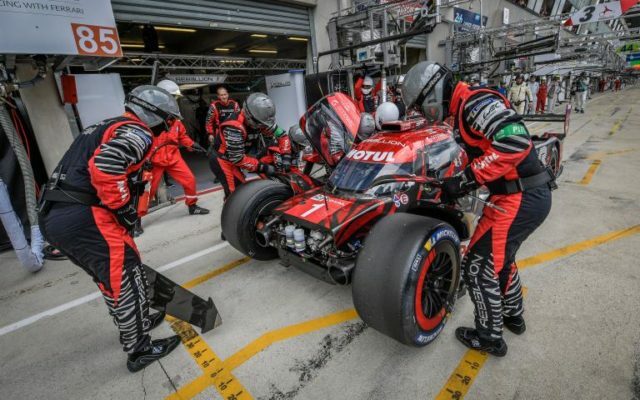 The non-Hybrid LMP1 cars were just not able to overcome the regulations which were written in favor of the Toyotas, and in the end the strongest privateer team of Rebellion finished third and fourth behind the winning Toyotas. 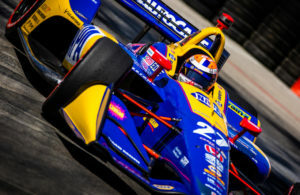 The problems that have plagued Toyota in the past did not materialize, giving Toyota a pretty dominating run for the entire race, with perhaps the only real drama occurring on the opening lap where Andre Lotterer ran into the back of Buemi’s #8 Toyota, damaging the Rebellion but leaving the Toyota unscathed. 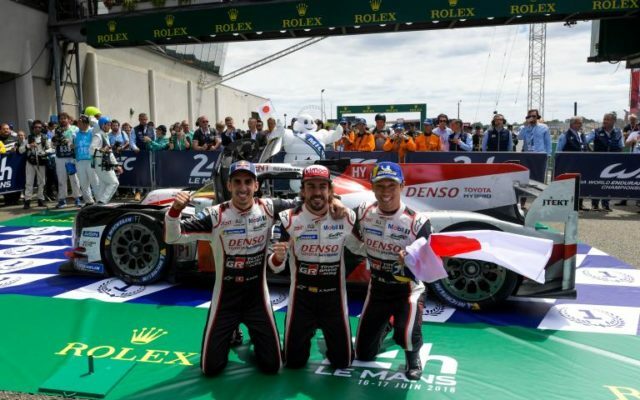 From there on, it was all Toyota and in the end, they have the Le Mans trophy that they have chased for so long. And of course, Fernando Alonso was in the winning car! 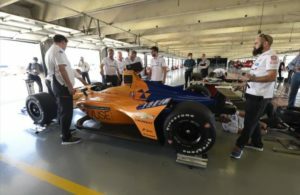 This movie could not have been scripted better, for now all Alonso has to do is now win the Indianapolis 500 to complete the triple crown: Monaco winner, Le Mans winner and Indy 500 winner. 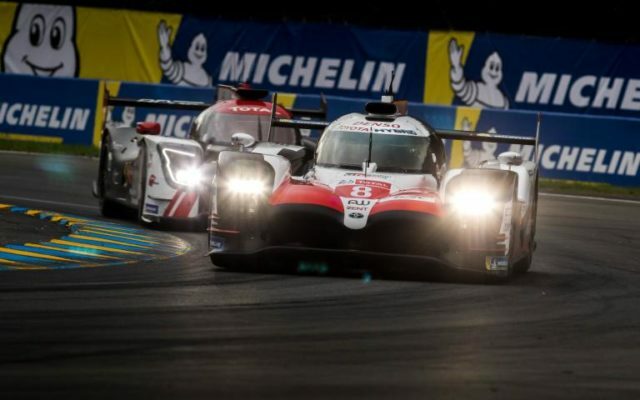 Although he has only driven one prior race for Toyota, winning Spa this year, Alonso finds himself now first in the FIA-WEC World Championship. 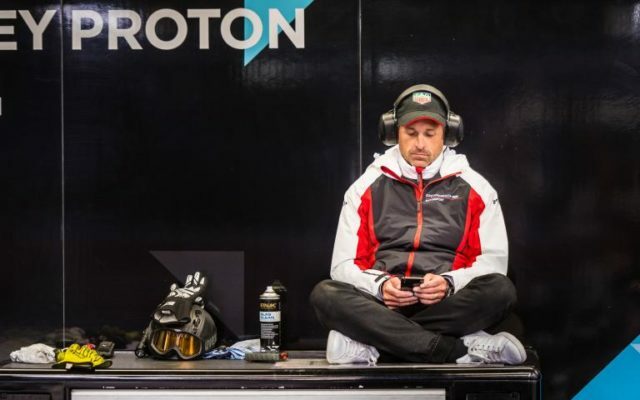 With the championship continuing until Le Mans next year as part of the “super season”, it is likely we will see Fernando racing more for Toyota in pursuit of another World Championship. 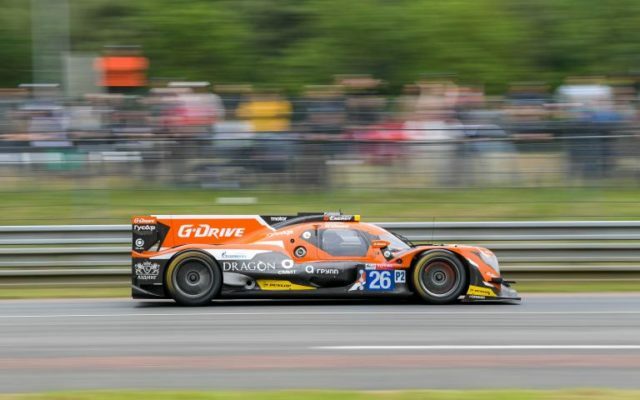 In LMP2 it was a dominating performance by G-Drive Racing, taking P2 honors with drivers Roman Rosinov, Andrea Pizzitola and Jean-Eric Vergne piloting their ORECA 07-Gibson. They led almost all of the 24 hours on the way to the win. In GTE-Pro, it was an all Porsche show, with the very popular retro designed “Pink Pig” #92 car of Michael Christensen, Kevin Estre and Laurens Vanthoor taking the win over the retro “Rothmans” tribute Porsche 911 RSR of Richard Lietz, Gimmi Bruni and Frederic Makowiecki. It was certainly fitting that Porsche factory entries take a 1-2 finish during Porsche’s 70th anniversary year. Again, it was a dominating performance by the two Porsches, as they led almost the entire way. And finally, in GTE-Am, it was again victory for Porsche and a popular one at that. 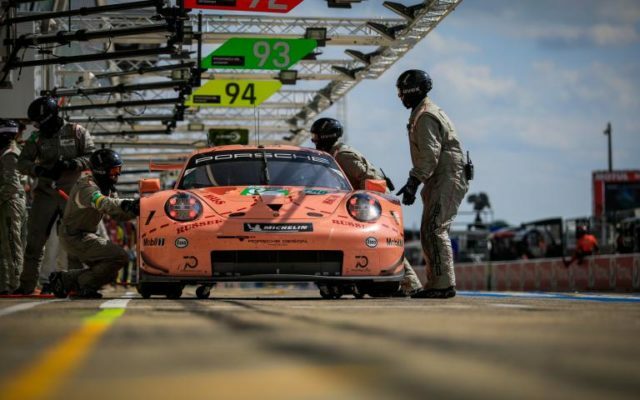 The Dempsey-Proton Racing Porsche 911 RSR of Matt Campbell, Christian Ried, and Julien Andlauer also dominated the race and were in the lead most of the time. 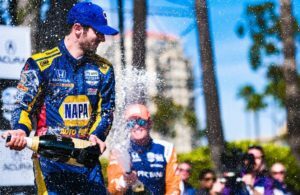 Run by racer and Hollywood star Patrick Dempsey, the victory was well deserved, and a nice bookend for Dempsey who has now won FIA-WEC races as both a driver and team principal. Perhaps not a classic Le Mans with the drama, heartbreak and excitement of previous contests, this one had the script play out like the main combatants intended. 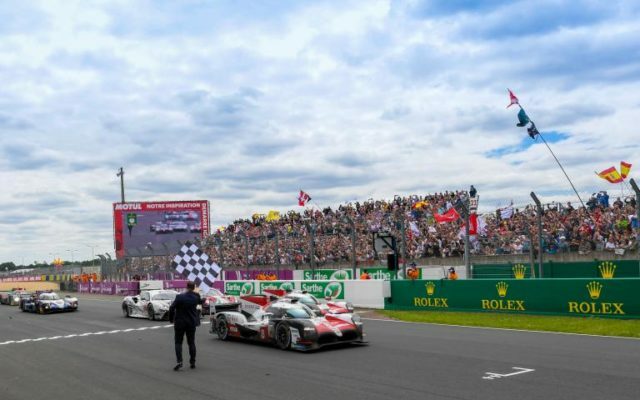 Toyota finally wins, erasing the embarrassment and disappointment of previous attempts, a deserving team dominates the P2 class, and Porsche takes honors in both GTE-Pro and Am classes to celebrate their 70th Anniversary. Congratulations to all the victors.